We’ll now have to wait until November to see Tesla’s electric semi-trailer truck. After first stating in June that the truck would be unveiled in September, CEO Elon Musk in September pushed back the reveal date to October. Come October, and Musk has announced yet another delay, this time pushing the reveal date back to November 16. In a Twitter post on Friday, Musk cited Model 3 production difficulties as well as relief efforts for energy supply to Puerto Rico and other storm-affected areas as the reasons for the latest delay. Musk also on Friday offered to discuss rebuilding the Puerto Rico power grid using renewable energy. He gave the example of the solar panel and battery storage system he helped install on the American Somoa island of Ta’u which supplies power to the island’s 600 residents. Musk said the system could be scaled up to suit Puerto Rico’s needs. With production of the Model 3 now underway, the semi truck is Tesla’s next major product tease. Musk first alluded to it in 2016 during the reveal of part two of his overarching product strategy known as the Tesla Master Plan. The plan also called for an electric pickup truck and new mobility solutions. A Model 3-based Model Y SUV is also being developed for launch in late 2019 or early 2020. The only official information we have on Tesla’s semi truck is the teaser shown above. Some additional info has surfaced from non-official sources, though. For example, in August we learned that Tesla wants the truck to be able to form a “platoon” on highways, where only the lead truck would require a driver. We also learned that Tesla’s truck would likely have a range of 200-300 miles on a single charge. Tesla is certainly not alone in exploring the potential for electric commercial vehicles and is actually behind the competition in this regard. 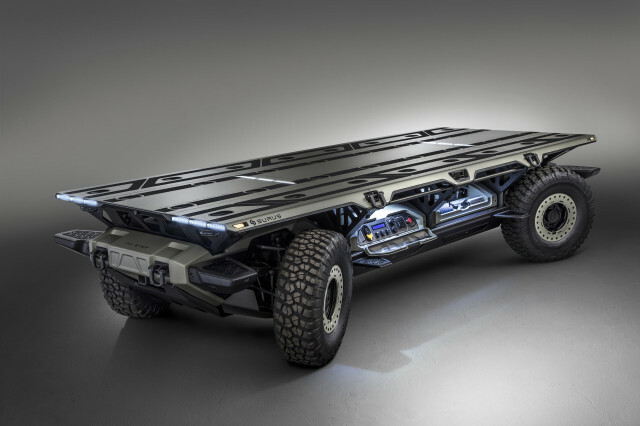 General Motors on Friday unveiled a modular platform for heavy-duty trucks that used an electric powertrain powered by a hydrogen fuel cell instead of a battery. The platform also incorporated self-driving technology that could enable it to form a platoon on a highway. Meanwhile, Daimler is already producing the Fuso eCanter electric truck, though this truck only has about 62 miles of range. However, Daimler is also conducting trials of a handful of electric vans and trucks and expects to have an electric semi truck similar to its Urban eTruck concept from 2016, with over 200 miles of range, in production towards the end of the decade. American startup Nikola also in 2016 showed us an extended-range electric semi truck that’s promised for production by the end of this decade. And in August, engine manufacturer Cummins showed off an electric truck concept. Cummins, however, is yet to mention production. Given stricter emission regulations coming into force in coming years, plus some cities possibly banning the use of vehicles powered solely by internal combustion engines, we should continue to see more players enter the segment. This will only make things more difficult for Tesla so further delays should be avoided at all costs. AI and automation will take jobs – but how and where?